Are you in the market for a new roof? Unless you’re in the roofing business yourself, prepare to hear a lot of unfamiliar roofing terms. Nothing is worse than agreeing to spend several thousand dollars on a roof replacement – or anything, really – and then realizing you’re not 100% sure what you’re getting. Hey, not everyone is a roofer! Let’s build up your confidence and make sure you can speak the language. Understanding key roofing terms before you jump into a conversation with a contractor will make you feel a lot better when you finally decide to sign that check. A shed roof refers to a roof that slopes in a single direction. Hip and gable are the two most common roof styles. Some roofs have just one of these styles, while others have several different style elements. For example, you may have a gable roof with shed-style dormers (dormers, by the way, are defined as “a roofed structure that projects vertically beyond the plane of a pitched roof”), or with combined elements of a hip-style roof and a gable-style roof. By knowing what type of roof you have, you will be able to understand your roofer’s recommendations and the re-roofing process that best suits your home. While often used interchangeably, slope and pitch are not exactly the same thing. The slope is the angle of incline. This roofing term is usually expressed as a fraction, or ratio, that represents the number of inches that a vertical rise increases over a horizontal run. The rise is the number of inches within one foot (12 inches, in case you forgot!) of run. A roof with a slope of 6:12 is steeper than a roof with a slope of 4:12. Gable roofs often have steeper slopes than hip-style roofs. Pitch is the incline of the roof. Pitch is determined by dividing the rise of the roof by the span from one wall to another. Usually expressed as a fraction, pitch is less precise, but still allows you to understand the steepness of your roof. It’s helpful to know either the slope or pitch of your roof. Very steep or low-sloping roofs can require special considerations. Your roofing contractor can determine the slope for you. You can also check out this information on how to measure slope and pitch from the International Association of Certified Home Inspectors. All roofs have a deck, eaves and ridges. Most roofs have valleys, too. Let’s explain what these roofing terms actually mean. Decking is the foundation of your roof. The deck is the base that rests against the “bones” of your attic to cover the rafters and support the weight of the roofing materials. Most decking is made from plywood or OSB (oriented strand board). OSB is the composite version of plywood. Eaves are the edges of the roof that hang over the exterior walls of the house. Gutters are placed at the edges of eaves. Most eaves house intake vents for attic ventilation. Ridges are the highest points on the roof where two roof lines intersect. As a mountain ridge is to a valley, so are roof ridges to roof valleys. Special shingles are used at roof ridges. Ridge vents should be installed at ridges to allow hot air to escape attic spaces. Streams flow from the mountains to the valleys. Water flows to the valleys of your roof the same way. For this reason, roof valleys are one of the first places where water will penetrate in a failing roof. Your roofing contractor will probably recommend installing special underlayment and flashing materials that you won’t see on other parts of the roof. These materials may be combined with unique install practices, like woven valleys, to create an impermeable barrier at your roof’s valleys. Ventilation is critical to the longevity of your roof. Ventilation is the flow of air through your attic space. This air flow allows moist, hot air to escape, keeping your roof deck cooler and your home more comfortable. Ventilation can be accomplished with intake vents and exhaust vents – usually at eaves and ridges – or power vents, if needed. Each of these materials plays a vital role in the whole roof system. If you’re not familiar with these common roofing terms, here are the basics. Underlayment is the base layer of your roof that can be found between the roof deck and the shingles. Made of asphalt and a fibrous mat (usually fiberglass or felt), underlayment can be waterproof or water-resistant; depending on the type and quality. For example, CertainTeed, one of our trusted roofing products partners, recommends waterproof Winterguard ice and water barrier underlayment at the edges of the roof and at valleys. Their DiamondDeck water-resistant underlayment is the better choice for the main roof deck, since the shingles don’t need the same next-level support at seamless areas. What are roofing shingles? Glad you asked. Shingles are the visible roofing material that are your home’s first line of defense against the elements. Shingles block UV rays from the sun and prevent water from leaking into your home. There are many different types of shingle materials available today, including metal, tile, and slate, but nearly 80% of homes across the United States use asphalt shingle roofs because asphalt shingles are affordable, versatile and visually appealing. 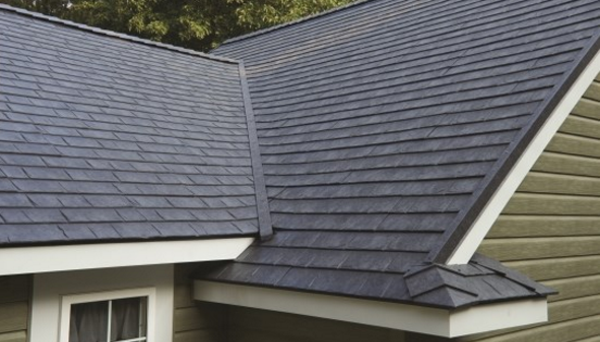 Read: Why are asphalt shingles right for my new roof? Flashing is a corrosion-resistant metal strip that is installed at roof edges and seams, These are the places where water is most likely to penetrate through the asphalt shingles and/or underlayment. Flashing provides an added layer of protection from water damage in the places where you need it most. Base flashing. Also known as step flashing. Applied directly to the roof. Cap flashing. Used around chimneys or walls. Also known as counter flashing. Drip edge. Applied at the roof’s edge, where the gutter is installed. Valley flashing. Applied at the roof valleys. Contact Long Roofing at (800) 417-5664 or visit us online to get a price, schedule a free, in-home consultation or find answers to any home roofing questions.